The newest and most authoritative information. 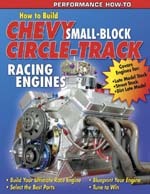 Build the ultimate engine for Street Stock, Late Model Stock and Dirt Late Model classes. Covers block prep and machining, short block assembly, cylinder heads and valvetrain, and then a full chapter each on engine building for a Street Stock, a NASCAR Late Model, and a Dirt Late Model. Includes tips and advice from top engine builders including Keith Dorton, Clements Racing Engines, Automotive Specialists, and KT Engine Development. Contains over 400 color photos.